Dapayk is a producer and live act to be reckoned with for the last ten years. Starting in comfortable Thuringia the Berlin based musician can now look back on a decade of his work. So Dapayk’s label Mo’s Ferry Prod. 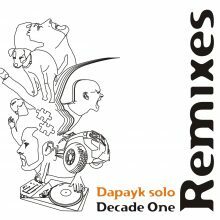 gives us „Dapayk solo – Decade One“. This is the second part – the REMIXES – where artists such as Dominik Eulberg, Format:B, Oliver Koletzki, Florian Meindl, Pan Pot, Heinrichs & Hirtenfellner and more put their hands on tracks of the various Dapayk projects.